Spring is in the air. In welcoming the arrival of warmer weather and, of course, the luxuriously long weekend over Easter, five-star hotels and standout restaurants in town are launching scrumptious afternoon tea sets for you to celebrate the season with your nearest and dearest. 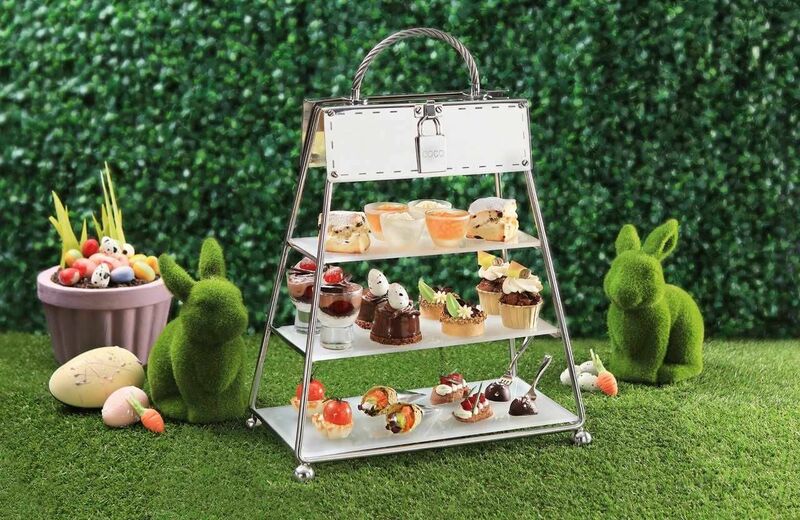 Below we select eight impressive Easter afternoon teas to put a spring in your step. The stylish café-patisserie Coco at the Mira Hong Kong reinterprets the lively glamour of spring with its “egg-citing” afternoon tea set, that will make any chocolate lover’s heart skip a beat. Guests can anticipate festive delicacies inspired by the whimsical aesthetic of Easter, such as Black Forest cake served in a shooter glass, fizzy chocolate mousse tart and chocolate Baileys cupcake. After having your sweet tooth satisfied, indulge in savoury delights such as spicy salmon and guacamole cones, beetroot and pesto cream cheese on chocolate lips bread, as well as foie gras mousse with sea salt chocolate lollipop. For refreshments, you can choose between either the seasonal special smoky chocolate drink or premium teas such as Jasmine Queen tea and Red Balloon tea. This afternoon tea set is priced at HK$428 for two, available from now till April 30. You can also add HK$120 for a glass of champagne to elevate your dining experience. Woobar at W Hong Kong rarely disappoints with its artistic charm and luscious creations. To celebrate spring as the fun-filled season of energy and creativity, Woobar introduces the “Beyond Color II: Infinite Vibrancy” afternoon tea for you to enjoy a vibrant splash of colours and flavours with 12 types of desserts and savoury delights. Satisfying to just look at, sweet gems in dazzling hues—such as yellow with a pop of brown from the refreshing lemon curd basil and caramel cube, or Tiffany blue from the dark chocolate mousse pyramid with blueberries—are not to be missed. This beautiful afternoon tea set also features savoury pastries including scallop tartare with yuzu avocado cream, foie gras and chicken liver parfait, and beetroot cured salmon mille-feuille with mustard. Crafted with premium ingredients, these colourful Instagram-worthy delicacies are served to liven up your palate. The set is available from now till April 30. It is priced at HK$488 for two from Monday to Friday, 3:00pm to 5:30pm. During weekends and public holidays from 2:00pm to 5:30pm, the set is priced at HK$638 with two glasses of sparkling wine served. Here's another premium afternoon tea set to satisfy your chocolate cravings. Lobby Lounge at Conrad Hong Kong is collaborating with the renowned chocolate label from France—Valrhona—to tempt guests with desserts crafted with the brand’s signature chocolates. The tea set features a tantalising line-up of sweets from Jivara 40% chocolate and cherry pound cake, Opalys 33% chocolate and strawberry tart to Alpaco 66% chocolate scone. You can also indulge in desserts such as yuzu chocolate dome and raspberry chocolate madeleine. The set also features bite-sized savoury pastries including smoked salmon mousse in profiterole, leek and gruyere tartlet, homemade foie gras terrine and so much more. For beverages other than coffee and tea, guests can opt for the special blue flower tea Celaya, made with Valrhona’s signature chocolate drink and earl grey tea for a subtle floral fragrance. This afternoon tea set is available from now till May 5, priced at HK$318 per person and HK$538 for two. For each serving for two, guests will receive a complimentary assorted chocolate gift box with six Varhona’s signature chocolates. Nothing really beats a decadent afternoon tea set that served in an elegant yet relaxed lounge. Located at the 103rd floor of the Ritz Carlton, where you can expect spectacular views and excellent service, the Ritz Carlton’s Café 103 is a must-visit spot for enjoying afternoon tea. Joining hands with Sugarfina, one of the world’s most beautiful brand of candy shops, executive pastry chef Richard Long and his team have reinterpreted the brand’s iconic cocktail candy collection with a set of six desserts and four savoury bites. Highlights of desserts include the Champagne Bears cup that comes layered with champagne panna cotta, champagne jelly and honey; and Pink Flamingos, which features pink grapefruit jelly and vanilla mousse. For savoury options, guests will find vanilla champagne blue crab and caviar with brioche bun, and the baked wild mushroom with truffle onion vol-au-vent. The afternoon tea set is available from April 15 till June 30 and is priced at HK$398 per set. You can also add HK$510 for one glass of Dom Perignon 2009 champagne. Guests who order the set will be gifted a voucher to redeem a complimentary soft serve ice cream or a special drink at any Sugarfina boutique in Hong Kong. The Peninsula Hong Kong gets a worthwhile mention for presenting one the most authentic and exquisite luxury afternoon tea sets in the city. This spring, executive pastry chef François Delaire and chef de cuisine Andy Cheng will bring a fresh twist to the hotel’s iconic teatime tradition with a brand-new menu. The tea set is all about offering guests zesty and refreshing flavours that celebrate the vivacity of spring. Served on sophisticated and elegant three-tier stand, guests can anticipate delicacies including sakura and raspberry cake, crab and vegetable choux pastry, and dill-marinated cucumber sandwiches. The set also features the Peninsula’s signature freshly baked raisin scones that served along with organic strawberry jam, satiny clotted cream, and a pot of speciality tea. The afternoon tea set is priced at HK$398 for one person and HK$718 for two. It is available from 2:00pm to 6:00pm daily from now till May 31. The InterContinental x Repetto afternoon tea is what dreams are made of. Known for always putting on a stylish display, the French luxury shoe brand uses its ballet theme to put a whimsical twist on the elegant sweet and salty treats prepared by the hotel's executive chef Maxime Luvara and executive pastry chef Christian Gonthier. Ingredients such as foie gras, truffles, raspberry and rose water can be found throughout the set, paying homage to France in the most delicious way possible. The afternoon tea set is also served with a selection of Fine Mariage Frères Tea. The afternoon tea set is priced at HK$688 for two persons, available until April 30. Each guest will leave with a Repetto perfume sample and gift card. If you’re heading to Macau for the weekend, the Mandarin Oriental Macau x Ferragamo afternoon tea is not to be missed. The floating afternoon tea set is inspired by Ferragamo’s spring/summer collection and the Mandarin Oriental’s pastry team does a phenomenal job at replicating the bold designs, down to the colour, motif and even texture. Looking both elegant and delectable, the set features desserts like blackcurrant chocolate delight, vanilla butter cake and pistachio mousse. You will also get to enjoy savoury items such as smoked salmon praline, king crab cucumber roll and chicken truffle ballotine. The set is also accompanied by delectable scones and a selection of fine teas. The afternoon tea set is priced at MOP 688 for two persons, available from now until April 30. Booking of afternoon tea set is required at least 48 hours in advance. Imagine an enticing array of Japanese delights is served with stunning views of the Victoria Harbour, where you can celebrate the season with artisan pastries and desserts as inspired by the theme of spring cherry blossoms. Specially crafted by Japanese chef Masayuki Goto and chef Rachel Ngai, the afternoon tea set begins with sushi made with seasonal ingredients, such as Tottori crab stick sushi and Kyushu eel sushi. Next are the savoury items including Hokkaido scallop with butter soya sauce and simmered Nagano seasonal vegetables. On the sweet side, you will find sakura jelly, sakura mochi and warm Kyoto uncongealed tofu. The afternoon tea set is priced at HK$688 for two persons and comes with a cup of roasted coffee or fine tea for each guest. A complimentary glass of champagne will be offered to each guest at the price of HK$988 for two persons. It is available on Saturday and Sunday, served from 3:00 pm to 5:15 pm.